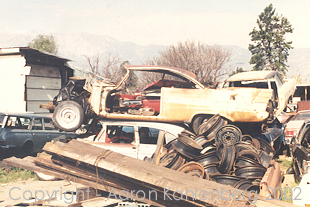 OK... so this Christine talk is really getting old but I have some info that should put your hopes of finding a junkyard full of Christine wrecks to bed. 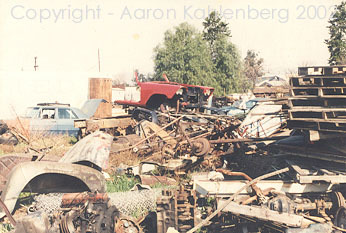 After the movie was done shooting, all of the leftovers were purchased by Bill and Ed's Auto Wrecking in Fontana, California. I know this because I went there right after the movie hit the theaters to find a rust free panel for between the tail lights of my 57 Fury. I was 15 at the time. They had EVERYTHING there and my father and I were allowed to walk through the yard on our own. We found a good rear panel on a 57 body (which is now on my car) and decided to tour the yard to see if a complete car could be built from what was left. We found the 'gas station car' with a huge X member welded across the top of the engine and other bracing below to keep the front end from crumpling up when it hit the Camaro. The 'first scene' car was there in truly ratty condition (LeBay's For Sale sign was even sitting in the back seat area!). 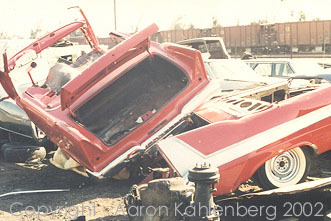 It was the same car used in Darnell's garage during the "you can't polish a turd" sequence. They just put on a nice hood, bumper, etc to make the audience believe that Arnie knew what he was doing (Those parts were missing in the yard). There were three rear halves of cars (from behind the doors back with no roofs) painted like they were brand new with all of the trim mounted (they even had the rear half of the frame with the differential and they even had the Remington wide whites mounted!). 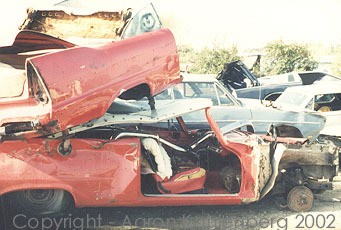 There was a painted front clip on top of a debris pile that eventually found its way onto a friend's 58 Belvedere convertible. 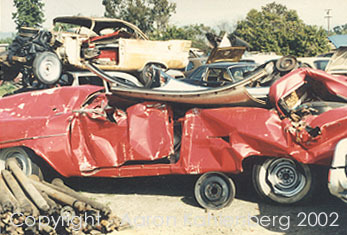 A stripped 57 Fury was on top of a pile of other cars. 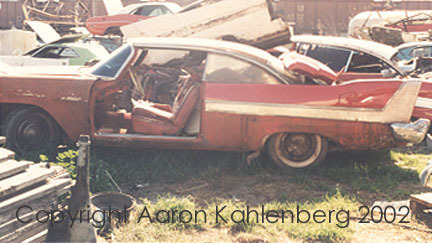 The 'suction car' was sitting on the ground with all of its rubber body pieces and the giant vaccum intact. It had tinted windows, no interior, and rubber everything... but was built around an internal 58 shell (they just cut the exterior sheetmetal away). Every single mold was lying around the suction car. I was able to buy the hubcap mold and one for the fuel door. I peeled the fuel door off of the suction car and kept that too. I think I have a chrome rubber Plymouth hood emblem around here somewhere too. The car that was crushed by the caterpillar was there. It had a dual quad 350 with chrome valve covers and air cleaners (probably the same car used for the beginning of the "show me" scene). There were two other cars that had been fairly complete. One was the one that backed up out of Darnell's office and was t-boned by the CAT. The other was just a mess... but had a full interior (also trashed). It was most likely what was left of the car the guys had fun using the sledge on. The best part of that day was the fact that I remembered to take my camera. I took pictures of most everything I saw. There were wing tips and tons of trim. Pieces of the 'burnt car' were lying around too. There was a huge roll of the aluminum they used to make the sport tone trim. The grilles were made shiny by painting them silver and then using 1/4 inch chrome tape to make them 'shine'. It was a Christine paradise -- if you can call it that. It was pretty depressing, actually. We saw what was left of the car that chased Moochie. In one scene the car does a 180 turn. Did you ever wonder how that car stayed so level? Well... there was a rear clip laying upside down that had huge chains welded to both the rear end and the frame. It apparently wasn't going to lean at all by the looks of how tight those chains were! Dad and I walked around for nearly 3 hours that day. Most of that time was spent trying to figure out if one complete car could have been built from the wrecks. The people at Bill and Ed's would have let us do it... they wanted to get rid of that stuff. Unfortunately, there just weren't enough good parts there to build a car. Sure, if we had the use of some welding equipment and a few weeks, we could have built a Frankenstein car. Who knows, maybe I could have sold it for $750,000!!! I'm just happy I was able to find a dry tail panel for the Fury. I know of a lot of other 57-58 Plymouth owners who were able to buy parts before they shredded what was left (and there wasn't much) -- so it wasn't a complete disaster as many have stated in the past. I saw cars and pieces of cars in the yard that day that would have equaled ten. Add that to the 2 that were left in decent shape (one was kept by John Carpenter and the other is the prize car that was given away in a contest, the one we all know about, and you have a total of twelve. I know that many of the cars were nearly unrestorable when they were bought for use in the film (the man I bought my Fury from sold a ratty 58 to the production company. My 57 Fury was considered 'too good' to destroy. I also heard from the men at the yard that the two 'beauty cars' were well taken care of during filming. From the evidence I saw in the yard, I know that fronts and rears of cars were cut away and used over and over -- some with rubber pieces too. It wasn't as bad as everyone assumes. I think the film has increased the awareness of the cars, which has helped each of us through increased values. I only wish that I could see a Belvedere hardtop in a color other than Christine red. The metallic green, Toreador red and the pale yellow cars are really pretty.